First reviewed on 7/31/09, Yummy: Eight Favorite Fairy Tales remains, by far, the best collection of fairy tales for the five and under crowd. And believe me, having read at story time for seventeen years and read to my own kids for even longer, little kids LOVE fairy tales - even the scary ones, and Cousins' have just the right amount of scary in them! Lucy Cousins is the creator of the wonderful world of Maisy the mouse and friends. 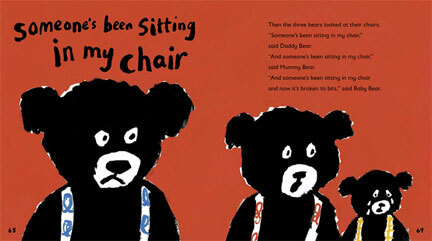 Her bright, playful illustrations appeal to babies, toddlers and pre-schoolers. With Yummy: Eight Favorite Fairy Tales, Cousins brings us a much needed collection of fairy tales for the pre-school and younger set. Big pictures and short stories make this a book that can be read from cover to cover for older listeners or one or two stories at a time for younger listeners. And, as her sly title and cover art indicate, Cousins' collection is not a whitewashed version of the classic fairy tales that are commonly on the shelves today. These are stories in which Grandmas and pigs gets eaten, the wolf gets his head chopped off, and the troll gets a great big bash in the face from Big Billy Goat Gruff. These are also stories that are vitally important to the imagination driven lives of young children, who tend to see the world in black and white with no shades of gray. In my post, The Importance of Fairy Tales I examine Bruno Bettelheim's classic study on fairy tales and child psychology, The Uses of Enchantment, to understand why fairy tales (in their original form) and, in a larger sense good literature, are so important to the emotional, moral, intellectual and creative development of children. To hold a child's attention a story must entertain and arouse curiosity, but to enrich a child's life, the story must, in Bettelheim's words, "stimulate his imagination; help him to develop his intellect and clarify his emotions; be attuned to his anxieties and aspirations; give full recognition to his difficulties, while at the same time suggesting solutions to the problems which perturb him." When reading or listening to a fairy tale, a child learns to "make some coherent sense out of the turmoil of his feelings" and he gets ideas on how to "bring his inner house into order, and on that basis be able to create order in his life." Fairy tales achieve this by stating an existential dilemma briefly and pointedly, by simplifying all situations and presenting a clear conclusion. Goats good, Troll bad. Pigs good, Wolf bad. Good beats bad in the end, even if you are down a couple of pigs by the time the conflict is over. Lucy Cousins does not shy away from this straightforward rendering of good and bad in the eight stories that make up Yummy. Little Red Ridinghood, The Three Billy Goats Gruff, Henny Penny and The Three Little Pigs all present tales where the conflict between good and bad takes a violent turn before reaching a victorious ending. However, the combination of Cousins' vibrant, childlike illustrations with the potentially upsetting aspects of the stories - Grandma's legs sticking out of the Wolf's mouth as he gobbles her up whole, bits of the Wolf protruding from a cauldron as the Third Pig cooks him for dinner - strikes a balance that should ensure sensitive listeners are not upset by the stories. 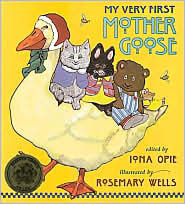 The Enormous Turnip, Goldilocks and the Three Bears, The Little Red Hen and the Musicians of Bremen make up the other stories in the collection. All of Cousins' depictions of the characters in the stories are superb, but Goldilocks with her wing-like pigtails, has to be my favorite of the bunch. And, it is very refreshing to find The Enormous Turnip, Henny Penny and The Musicians of Bremen, slightly less common stories in this century, included in Yummy. Again, I can't stress enough how important and perfect I think Lucy Cousins' fairy tale collection is. Aside from being a well chosen selection of stories, Cousins' telling and illustration of these tales is ideal for the toddlers and pre-schoolers for whom these classic stories of conflict and resolution are tailor made, and fills a long empty gap on the shelves. Thank you to Lucy Cousins and her brilliant publisher,Candlewick Press for making sure that traditional stories suited for children five and under are still in print. 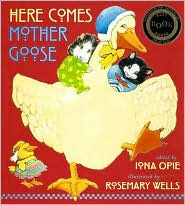 Also, Yummy makes a PERFECT baby shower gift, especially when combined with another classic published by Candlewick Press, Iona Opie and Rosemary Wells' indispensable collections, My Very First Mother Goose and Here Comes Mother Goose. While everyone else is buying Goodnight Moon and Love You Forever for the baby, you will be giving gifts that are perfect for growing into and often forgotten or overlooked - nursery rhymes and fairy tales. Three versions of Goldilocks and the Three Bears retold by the exceptional team of Jim Aylesworth and Barbara McClintock, Jan Brett and, adding a bit of humor to his substantial retelling, James Marshall. Retellings of The Three Little Pigs, from the silly to the classic to a whole new twist by: Steven Kellogg, James Marshall, Jon Scieszcka and Lane Smith and Eugene Trivizas and Helen Oxenbury, whom everyone should know from her illustration of the classic, We're Going on a Bear Hunt written by Michael Rosen. 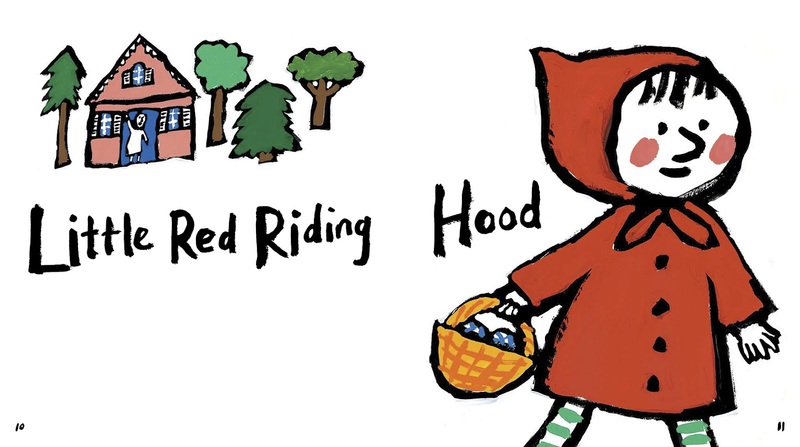 Three great retellings of Little Red Ridinghood include books by: Trina Schart Hyman, winner of the Caldecott Honor winner, Jerry Pinkney and James Marshall. A couple of takes on Chicken Little, or Henny Penny as the story is sometimes called, by Steven Kellogg and by Ed Emberley and his daughter Rebecca. Classic Golden Books edition of the Little Red Hen as well a version by Paul Galdone, who is your go-to-guy when you are looking for a solidly re-told and illustrated version of any classic tale or rhyme, including The Three Little Kittens, Three Bears, Three Little Pigs and the Three Billy Goats Gruff to Rumplestiltskin and The Gingerbread Boy. The Bremen Town Musicians, a story I had heard of but never read, can be enjoyed in a translation that adheres closely to the original tale from the Brothers Grimm as well as a version by one of my all-time favorite illustrators of fairy tales and classic stories, Lisbeth Zwerger, who's beautiful, dreamlike paintings are not to be missed. And, finally, a story that doesn't get much more nuanced than the Lucy Cousins' version included in Yummy, but might be worth checking out anyway, The Three Billy Goats Gruff. Paul Galdone and Marcia Brown, illustrator the Caldecott winning Stone Soup, illustrate these editions. hi, does any of those children books (henny penny, 3 little pigs, Red riding hood etc) have any scary illustrations like the wolf/fox eating other characters or being pictured with a fat tummy? I'm not sure I can answer that question without really knowing what you/your child consider scary. Some kids might find the wolf reaching out for Little Red on the cover scary, but, then again, being scared is a vital part of a story telling experience, as is the clear delineation between good and bad that these stories represent. Yes, there is a full page picture of Granny's feet sticking out of the wolf's mouth as he gobbles her up. The troll in the 3 Billy Goats story is pretty icky looking. The wolf's drooling mouth is seen in the Henny Penny story, but it does not show him eating any one or being full after. And, you do see the wolf in the pot after falling down the chimney in the 3 Little Pigs. I understand parental concern and I do realize that there are some intensely sensitive children in the world, but, please consider at least perusing this book yourself if you are thinking of reading it to a child. Thanks for your kind answer, it was really helpful. Glad to know that! Thanks so much for reading my blog! Lucy Cousins in a fave. We will be checking it out!